At first there was John, Paul, George and Ringo – The Fab Four. They were one of the most influential acts of the rock era. Then came the Fab Five – Ted, Kyan, Thom, Carson, and Jai – another influential group in their own right. While the Fab Five was not known for their musical talents, instead, they combined their powers of superior fashion, style, personal grooming, interior design, and culture for the greater heterosexual good. When Queer Eye For The Straight Guy debuted on July 15, 2003, it was not without its criticisms, but over its 5 season run, it helped towards the acceptance of gay people by mainstream media. While the last episode might have aired just over ten years ago, if there was ever a time that the world could use more gay on TV, it’s now. 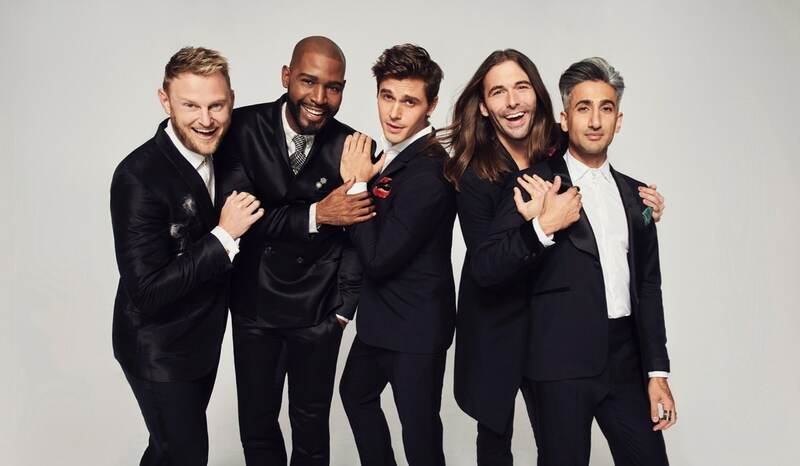 Netflix, known as the place for second chance viewing and award-winning content, announced a year ago that they would be bringing Queer Eye back on its streaming service. This caught people a little off guard as it was quite unexpected. Would the show stand the test of time? Would this be another season with the original cast or something new? Could they capture the magic and entertainment we loved about Queer Eye the first time around? As the details trickled out, we learned that Netflix’s Queer Eye would be more of a Queer Eye 2.0. There would be a whole new gay cast tackling a whole new set of straight guys. It would air globally with eight episodes. The new Fab Five still have their specialties and unique personalities that they bring to the show. First up to take up the Queer Eye mantel is Jonathan van Ness. Handling the grooming, van Ness, the Los Angeles based-hairstylist, might be best known for his Funny or Die show, Gay of Thrones, recaps of Game of Thrones episodes. On fashion we have Tan France who has had extensive experience dressing people pretty. From working in his grandfather’s denim factory to running various clothing brands including Kingdom and State. Design expert Bobby Berk will tackle the interior (or exterior) design remodeling. His history of appearances on various networks include HGTV, Bravo, NBC, and CBS. This time around, the food and wine is being handled by Antoni Porowski. Although a relative newcomer to the food scene, Parowski’s taste in food and wine has been vouched for by previous Queer Eye food guru, Ted Allen. Last but not least, no Queer Eye For The Straight Guy reboot would be complete without a resident culture expert. No stranger to reality television, Karamo Brown takes on this role. His first television appearance was on Real World Philadelphia followed by a season of Real World/Road Rules Challenge before spending a decade as a social worker. Since then he’s also been on The Next 15, Dr. Drew’s On Call, The Young Turks, and served as a recurring guest host of Access Hollywood Live. He’s also been host and producer of HuffPost Live and is currently hosting MTV’s Are You The One: Second Chances. Not only that but he founded 6in10.org, which is an organization that works to combat HIV stigma and provides mental health support and HIV education, he volunteers as a youth counselor at the LA LGBT Center and is the health and wellness ambassador for both the Center for Disease Control and the National Black Justice coalition. It is this wealth and experience that he brings to the show and offers some its most insightful moments and conversations. In the vein of experts helping ordinary people improve their lives (aka Biggest Loser and Extreme Makeover: Home Edition), this show also changes the lives of people visited by these 5 gentlemen. The show has done a great job of finding charming, likeable “straight guys” in need of the gay touch. Right from the very first episode, I found myself rooting for Tom, an older redneck who lives for his grandson and wants to improve himself in order to win back the love of his ex-wife. Tom, Neal, AJ, Bobby, Jeremy, or any of the other guys chosen for a remodel, there’s something to learn from each episode. Netflix’s Queer Eye does more than just bridge the hetero-homo gap. It touches on important real world topics like racism and the treatment of people of colour (POC) in the US. In the beginning of the episode, the group are on their way to meet Cory, when they are pulled over by a police officer. Although the officer turned out to be a friend of Cory’s and the whole stunt was to surprise the guys, it ended up being a very tense situation. Something that many POC experience every day. Later, Cory, who is also a police officer, and Karamo are riding in a car together when the conversation turns towards the hostility between the police and black community and how racism in many cases leads to an abuse of power and even death. The conversation is both intelligent and illuminating – something I really didn’t expect from the show to be honest. With this new Queer Eye For The Straight Guy, it actually makes a great Sunday evening show with the family or on your own. It’s the perfect Sunday recovery activity leaving you charged and ready to take on the next week and improve your life too. Not only will you learn about how a green stick can tone down redness but you’ll also learn that listening to the experiences of others can bring unlikely friends together. All 8 episodes of Netflix’s Queer Eye are now available to watch globally.